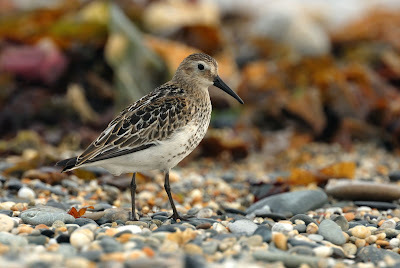 This was the best of a burst of shots of a juvenile Dunlin feeding on the shoreline on Long Rock beach on Sunday night. It gave one of those momentary pauses that waders do. It was quite tame and whilst I should have been concentrating on finding the Baird's Sandpiper, I couldn't resist this opportunity. EXIF Detail: RAW format. Focal length 840mm. Ap F/6.3 Shutter speed 1/125s. ISO 500. Exposure -0.3 EV.